Splendidly written, The Virgin's Daughters, by Jeane Westin, captures the essence of service, honour and love in the court of Elizabeth I. Stories of ladies–in-waiting and their relationship and attachment to their queen are really tops in my list of favourites to read, in both fiction and non-fiction. So, I was peeked with interest in this particular novel, where the author unravels the turbulent love stories of two such ladies living similar journeys leading towards different outcomes. The story begins with Lady Katherine Grey, sister of the beheaded Jane Grey- and cousin to Elizabeth I. Kate was torn between her love of service for the Queen and her lifelong love, Edward Seymore (in direct lineage with Jane Seymore, Henry VIII’s third wife; hence first cousin of Edward VI). Let’s just say that with lovers of such high pedigree, Kate’s position at court was of more than particular interest to all. Not only did Kate serve the Queen-she was also named successor to the throne, in accordance to the will of Henry VIII, her uncle. A marriage to her beloved ‘Ned’ invited the possibility of future male heirs; whom, Elizabeth deduced, would have most certainly jeopardized her throne. The second part of the book is about Mary Rogers, a distant (and decades younger) cousin of both Elizabeth I and Katherine Grey. ‘Mouse’ as Elizabeth often called her, was more of a country girl than a noble. With great aspiration to completely devote herself to her Queen, Mary never swayed. When love to John Harrington (Elizabeth’s godson), was forbidden in order to permit a promised marriage of which Mary wanted no part, loyalty to her Queen again prevailed. In conjunction, The Virgin’s Daughters, takes us through the life of the young and beautiful Elizabeth I and her tumultuous relationship with Robert Dudley, her impossible, yet everlasting love. The second part sees an aged and less lustrous Elizabeth in her ending years, with the Earl of Essex playing the role of deplorable substitute as favourite to the Queen. Throughout the book, we can sense Elizabeth’s emotions and reactions towards these men and the importance they held in her life. Consequently, Elizabeth’s decisions regarding her ladies were exercised through the reasoning and beliefs she held about love and loyalty and all that it entailed. It would only be logical for her to expect no less from those in her service- sacrifice for a higher purpose. Elizabeth reigned supreme and ultimately, love for her country always came first. I really enjoyed reading about the deceptions and triumphs of these young women who suffered honorably for a cause they remained faithful to, until the end. The Queen was everything to them, much to their demise. And, although I cheered them on and wanted happiness and love for them both, it was often difficult for me to understand this total devotion for their sovereign. Most times I found Elizabeth to be cruel and even coarser than Henry VIII ever was. In fact, Elizabeth seemed cold, unmoved, vain, self-serving and completely incapable of love in any form. Harsh? No, I think it’s ingenious. Westin, I believe had me exactly where she wanted …completely magnetized by Elizabeth. Throughout the book I kept hoping for my desolate heroines, and every time, the unexpected happened. I enjoy it when a book keeps me this entertained. As for Elizabeth, her portrayal, which had me despising her, also led me to an unwitting, yet forceful need to admire her. I’ve never been a die-hard fan of Elizabeth (yeah, I’m one of those-sorry), but her portrayal in this beautiful novel, manages to bring forth her greatness as ruler and sovereign without ever undermining her vulnerability as woman, lover and ...mother. Unfaltering to the end, Elizabeth was faithfully committed for the sake of a higher purpose. When seen under this light, I began to comprehend Elizabeth’s difficult choices and their impact on history. In The Virgin’s Daughters, the Queen’s verdict always determined love’s fate, albeit at a cost to all those involved…even Elizabeth. Historically accurate and beautifully written, you will find more than just love stories to remember along with the insuperable power of a queen. The Virgin’s Daughters takes you deeper –distinguishing itself by making a significant impression that will leave you pondering about forbidden love and royal reasoning in the times of Elizabeth I. This week I will also have the pleasure of having Jeane Westin guest post here on Enchanted by Josephine. Look forward to a most insightful article on Elizabeth - along with a great Giveaway of her book! My site was in dire need of a make-over and as you've probably already guessed...I just can't let go of the pink. It's my absolute favourite colour, so I need to hang on to that a while longer:) I love it! Thanks to my good friend Marie at The Burton Review, who's site has also gone through quite a few changes this week (she even has her own domain now: (www.theburtonreview.com))- she's so patient with me when it comes to all this techno stuff. Let's just say she walked me through the whole thing. She's an expert at this (amongst other things). If you've never visited her site before- go now-it's a MUST. There is always so much stuff happening there; from reviews, book talk,author guest posts, historical events, info, updates, memes and so much more. Thanks Marie! So, what say you? How do you like JoJo's new look? At a mere 71 pages, the letters don’t skip a beat in keeping you entertained and totally involved in the plotting of Lady Susan’s twists and deceptions. Claiming that all the females in her family are against her, she confides solely in her friend Mrs. Johnson, who is equally as conniving as she is. 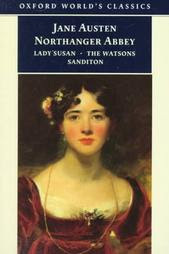 Lady Susan becomes involved with more than one gentleman and decidedly rips apart relationships of sorts in trying to gain the admiration and infatuation of at least three of these. In the middle of all this scheming, and affected by it all are; her daughter (to whom she shows no care of any sort); her brother and sister-in-law (who catch-on to who she really is); her sister-in-law’s brother (who falls in love with her) and parents (who are bereaved by it all)…to name a few. All in the name of what you ask? Being a coquettish pro, Lady Susan desires freedom to flirt while respectfully mingling in society, enhanced by the cherishing comforts of wealth within a marriage ...and preferably to a man who’d be oblivious to it all. 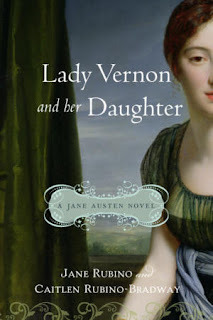 If you’re in need of a quick Austen fix, I recommend you read this. You won’t be disappointed. Loved it! 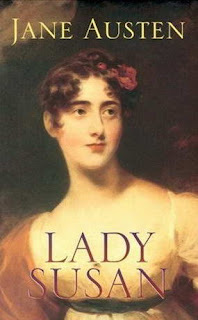 I’d like to mention that if it hadn’t been for a super nice, friendly and talented blogger friend of mine: Maria Grazia from Fly High (she’s also an excellent teacher who happens to live in Rome)- I wouldn’t have even known about Lady Susan! It was only after reading her wonderful and detailed review on this work by Jane Austen, that made me want to search for it online. Go check out her amazing and well-read blog. Giveaway Winners of HF Bloggers Round Table Event Announced!!! Before I begin announcing the Winners of my Giveaway, I want to start by raving about what a fantastic week we had with the Historical Fiction Bloggers Round Table Event! I want to especially THANK my wonderful partners for everything they did to make this event a total success. All of you- Arleigh from Historical-fiction.com, Amy from Passages To The Past, Lizzy from Historically Obsessed, Heather from the Maiden's Court, Allie from Hist-Fic-Chick were totally amazing! For any of you who,ve missed this grand event and would like to check it all out, the schedule of events passed is on this page. And for the Grand Summary- you can visit The Burton Review who's got it summed up beautifully. Amy at Passages To The Past also has a fantastic summary of it all as well. Giveaway # 1: Leonardo's Swans...The Winner is: Barb from Meditative Readings!!! Giveaway #2: Royal Panoply...The Winner is: Virginie Barbeau from Virgine Says!!! 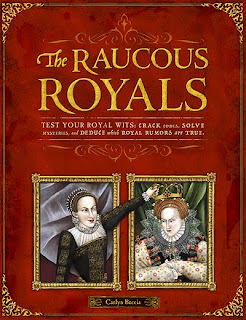 Giveaway #3: The Raucous Royals:...The Winner is: Michelle from The True Book Addict!!! Winners Please email me with your contact info. Congratulations!! ....Jennifer from Rundpinne blog!!! Congratulations!!! 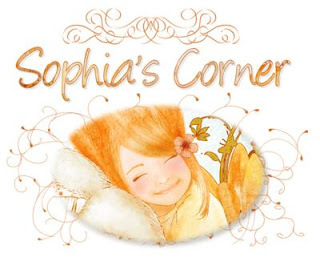 Day 5 of HF Bloggers Round Table- BOOK REVIEW, Sophia's Corner ...And...GIVEAWAY!!!! Trust your feeling-You’ll be right on. Instantaneously this book will grab your attention with its gorgeous cover, regal writing, royal colours and cleverly amusing illustrations. A deliciously tempting visual fest, The Raucous Royals is filled with the most outrageous historical rumors that instantly captivate the interest. Your child will want to find out –Did that happen? That’s so funny! That didn’t happen!...Or, did it? No way to find out but to keep on reading; and that’s what will happen cause your child won’t let you put it down. Carlyn Beccia (check out her blog)is a fantastic author! She has devised a sure way to whet a child’s appetite for history. The book is filled with guessing games, secret codes, experiments, quizzes and the most hilarious, almost caricature-like illustrations ever. And that’s only the half of it…the best part is savored in the history! That’s where you discover whether King Richard really did murder his nephews; or whether Anne Boleyn had six fingers; if Mary Queen of Scots plotted to assassinate her cousin Elizabeth I-or- if King Louis XIV took only three baths in his life! What?! All rumors? Or fact? You won’t be misled. Everything is explained with clarity, fun, and complete accuracy. Carlyn Beccia’s work reveals itself as intelligent, witty, creative and well researched. The Raucous Royals is filled with interactive, thought provoking questions and topics that trigger the mind. Your child will love using his detective instincts to search and find out the truth while learning interesting historical facts. I just can’t say enough about the presentation and content of this book. Well written and beautifully illustrated; the book will captivate young children, while being sophisticated enough to keep older teens just as enthralled. The perfect blend between historical accuracy and splendor in creative entertainment, The Raucous Royals depicts history through an amazingly unique and enticing approach that will have kids falling in love with the past. What does Sophia have to say? I liked reading about Henry VIII so much! He was so fat that his servant people carried him around. He’s my favourite and that was so funny. I even learned how to write the code like Mary the Queen of Scott. That was fun too. Right now this is my favourite, bestest book in the world. Rating: 5 Castles butI want to give it 6! One author-signed copy of THE RAUCOUS ROYALS!!!! At The Burton Review: Guest post by Robin Maxwell - AND - 2 GIVEAWAYS!!! PLUS Another PLAIDY GIVEAWAY HERE!!! Marie also has an update on ALL THE GIVEAWAYS LISTED SO FAR, on this last day of this spectacular event!! Yet ANOTHER Original GIVEAWAY at All Things Royal..A must-enter!! 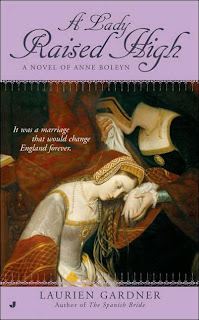 At Hist-Fic-Chick there's a GIVEAWAY of an autographed copy of Philippa Gregory's The Constant Princess!! Day 4 of HF Bloggers Round Table Event...Yes, there's more!!!! 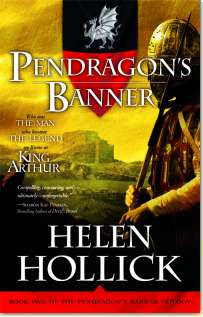 Today over at Maiden's Court, Arleigh from Historical-fiction.com is Royal Heiress for the day. A signed copy of The Other Boleyn Girl by Philippa Gregory, a copy of The Life and Death of Anne Boleyn by Eric Ives, and an Anne Boleyn hand mirror over at Arleigh’s blog – hurry though, it ends September18th! Over at The Burton Review, Marie has yet ANOTHER GIVEAWAY!!! Day 3 of HFB Round Table Event: Book Review and another GIVEAWAY!! What an exciting week this is turning out to be! Today, Amy at Passages To The Past is interviewing me! 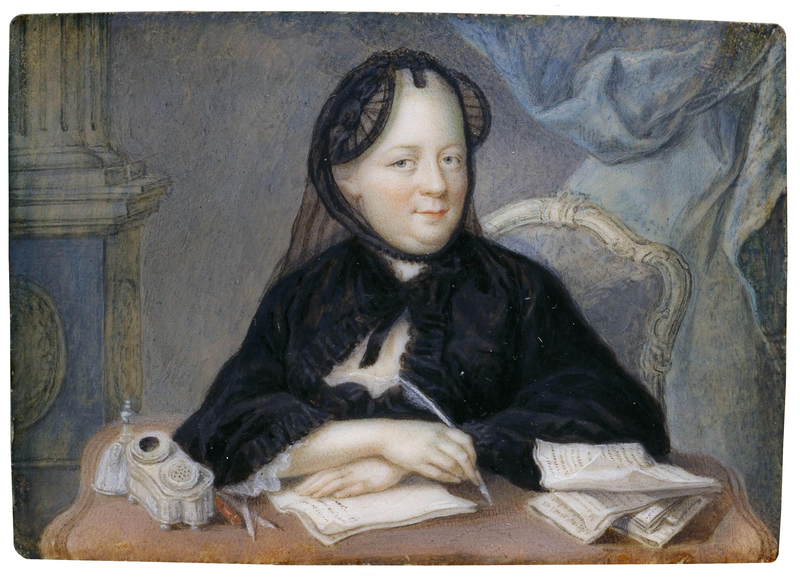 I've also written a piece on Josephine's grandaughter...Josephine. How wonderfully a-propos to have finished reviewing this book just in time for our Historical Fiction Bloggers Round Table Event! I’d love to start off this review by giving you an all-around basic idea about what the book is about, but there’s a lot more to this read than meets the eye. Unlike many of the other books that I enjoy for the pure pleasure of reading, Royal Panoply served much more than just this purpose. Besides its impressive array of English monarchs beginning with William I all the way to Elizabeth II, this book features impressive details that go beyond simply describing royal lives, conquests and fates. Carolly Erickson takes into particular consideration the fact that it may be a reader’s first encounter with any or most of these royals. At the beginning of every new sovereign, the author minutely goes back into the life of his or her predecessor to work us up until the particular heir in question. It’s only when you’re reading and trying to keep track of this incredible genealogy that you come to appreciate this very necessary task so eloquently re-capped. This sort of going back and then taking you forward into the history also helped me see the historical figure from different perspectives. This, added dimension to the characters, as well as the period highlighted. And, as we all have our favorites, it’s a special treat when you can read about each of these family dynasties in subsequent order. However, if you prefer to just pick, sort and choose who you’d like to read about, this book offers you the option of doing just that; it can be just as useful and interesting when read in no particular order. The author’s re-capping method at the beginning of every new chapter served that purpose wonderfully. It is also possible to use this book as a reference manual when you want to look up a specific monarch, or simply for refreshing your memory while on a different book dealing with a particular historical figure. I was delighted to be able to use this book in precisely that way. I began by reading it through, but then found myself going back to it for reference and research purposes as well. Useful, interesting and a delight to read. A definite history buff must-have. 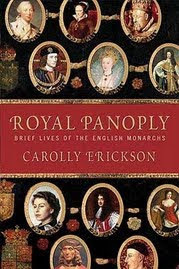 For our Grand Event, I'm GIVING AWAY one copy of... ROYAL PANOPLY! 1 Chance: Leave a comment telling me who is your favourite English monarch. - At Historical-fiction.com, the Royal Heiress of the Day will be Lizzy with a Guest Post on Catherine Howard, The Rose With Out a Thorn- Arleigh also has a fantabulous GIVEAWAY! DAY 2 of HFB Round Table Event - AND - BBAW Guest Post! During the course of the day, some more exciting stuff will be happening over at Hist-Fic-Chick. Today, the Royal Heiress of The Day is AMY and along with her interview will be a fabulous post on the very favourite: Elizabeth I. PLUS, Marie at The Burton Review has the amazing author, Michelle Moran as a Guest!!! And, Marie has a fantastic GIVEAWAY of The Heretic Queen!! This week also happens to be the BBAW. 1)What was it that got you started on blogging? I've always loved to read, but no one around me does. Every time I finished a book, I would want to discuss it with someone or recommend it to a friend, but no one was too interested. So that's how blogging came about - I thought it'd be a great way to share my passion for books, and hopefully get feedback from others. I also saw blogging as a way to bring attention to books that self-published or published by smaller publishing houses and don't receive as much attention. 2) During this Blogging experience, what amazed you-or- continues to amaze you the most? I think what amazes me the most is the accessibility of publishing houses, authors, promoters, etc. Prior to blogging, I sort of saw them as being on a different playing field and separate from us regular readers. Since starting Luxury Reading, I've developed relationships with many of these individuals and continue to be amazed by how many of them read and respond to the reviews we post. 3) What has been your favorite read of 2009 so far? Why? I think the book that left the biggest impression on me this year was "Scheisshaus Luck" by Pierre Berg, and it was also one of the first books I reviewed on Luxury Reading. It was very interesting to read about Holocaust from the perspective of someone who was not Jewish, and wound up in a concentration camp by accident. As any memoir about Holocaust, it was a difficult read, but Pierre's attitude in writing his story was just amazing. He wanted people to know what happened and to share his experiences, but not to feel bad for him. And I think it was his survivor's attitude that pushed him through all the difficult times he endured. Yes, definitely! As I mentioned before, I have developed relationships with promoters, individuals in charge of publicity at publishing houses, authors, other bloggers, and so on. I love hearing from authors who read our reviews of their books and are thrilled with what we have to say. Book bloggers are also such a tight knit community (and I never realized this before starting the blog) and it's been great to talk with and discuss books with other bibliophiles! 5) Who (author, celebrity, politician...)would you love to have host your blog for one day? Oh gosh, that's a hard one. I would love for Philippa Gregory to host the blog for one day. I absolutely love her books and buy every single one in hardcover as it comes out - it's quite a collection! AND- TODAY, Vera is also hosting...ME!! She's also interviewed me for the BBAW. Go check it out! HF Grand EVENT Begins!! Interview, Guest, Post and GIVEAWAY!! Good morning for this fantastic Historical Fiction Bloggers Round Table Event, today I have the Honour of presenting to you, Royal Heiress of the Day: Heather from the Maiden’s Court. This gal is fantastic-not only does she love history and reading about it, she also posts the most interesting historical fiction reviews; most of these responsible for my ever-growing TBR list!! And If that’s not all, she’s also the nicest person you’ll ever meet:) I’m so happy to have her join me today for our very first post to this grand event! Heather has answered some interview questions for me and has agreed to write a fabulous guest post for Enchanted By Josephine.I present to you: Heather! 1-When and Why did you start blogging? I started blogging at the end of May this year (I can’t believe it has only been a little over 3 months!) I had been an active member of the Philippa Gregory Message Board for about a year and about 2 weeks before I started my blog, a friend from the message board (Susie Tudor Daughter) had announced that she had created a blog. So I spent those 2 weeks exploring her blog and checking out the blogs of others, which got me really excited and thought “I can do this!” And thus, my blog was born! 2-What has been your best blogging experience? I would have to say that my best blogging experience has to do with Michelle Moran. After reading Nefertiti and checking out her website, I decided that I wanted to try hosting my first giveaway. She was the first author that I had ever contacted and she was absolutely wonderful! She is one of the nicest people. 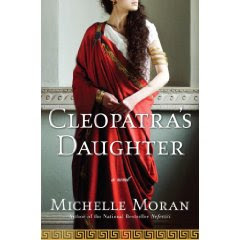 She stopped by my blog after the giveaway and posted a comment (which I was super excited about) and sent me a further email later on offering me Cleopatra’s Daughter for review. It was the best experience I could ask for with my first contact with an author, first giveaway, and first review offer. 3-What is the most interesting book you’ve ever read? Why? I’m really going to have to go with The Other Boleyn Girl by Philippa Gregory for this one. 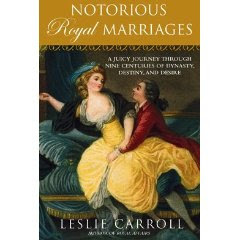 I didn’t really know much about the Tudors before I read this book – I couldn’t name more than 2 of his wives. Not only did I love this book for the way it was written, the unique perspective, and the wildly entertaining story it told – but it really opened my eyes to historical fiction. Since I was 12 I had been reading some historical fiction – but it was mostly based on American history events. I had never really thought about looking at other countries. Reading this book really got me interested in Tudor history and from there spawned my interest in other royalty and historical periods. 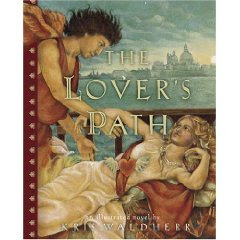 You could say it is really where my love of historical fiction started. 4-If you could go back in history and meet your favorite figure of all times- who would that be? Why? Man, this is a tough question – I’m wavering back and forth between a couple of people. I think I would have to go WAY back and meet Nefertari. She has always been my favorite Egyptian queen. I would love to see if she really looked like the beautiful images painted of her. I would want to ask her about what it was like to go out to war with her husband and be such a strong woman when that wasn’t really the norm. I would want to ask her about her family and where she came from because not a lot is known. I think it would be a very informative conversation filling in many of the holes that are left today in what we know about her. 5-Who would you absolutely love to interview/ or have guest-post on your blog? I think it would be an absolute dream to have Philippa Gregory guest-post or be interviewed on my blog. 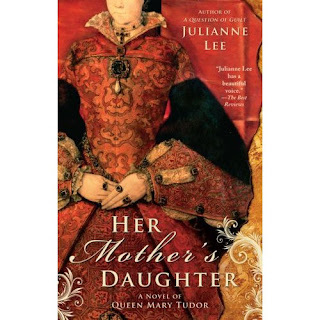 Like I said earlier, her book was a reason I really became interested in historical fiction and I have read almost all of her Tudor series; I just have The Other Queen left. There would be SO many things that I would love to ask her about. 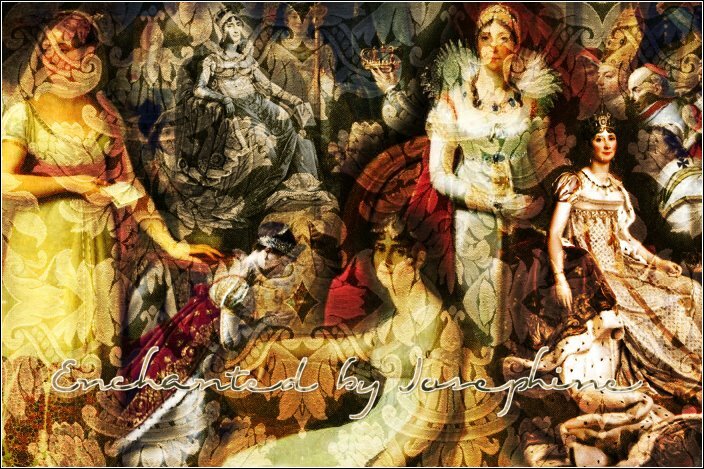 Cleopatra is an iconic woman and her death is something that is much talked about. There are so many images painted of her death – if you do a simple search you will find many different versions of this event. There are a couple theories that have been passed around over time as to how she died; some are more believable than others. Some are more based on fact while others are better for their storytelling quality. 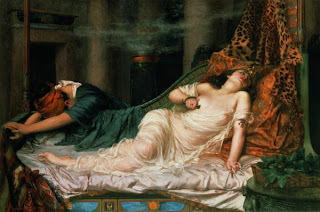 It is known that Cleopatra poisoned herself. The most accepted theory of her poisoning is the bite of an asp that she applied to her arm (or breast depending on the story). The story is that an asp was hidden in a basket of figs and when she saw it (knowing that there was no way out) she let it bite her. Some believe Octavian made sure the snake was in there when it was sent to her – so he wouldn’t have to kill her; others believe that it was just in the basket. The story of the asp is supported by the presence of 2 pinprick marks on her skin. Another theory that utilized these pinprick marks is that these were scratches from applying a poison to the skin with a hair pin. This theory doesn’t account well for the death of her two maids though. Most storytellers have adopted the snake bite theory as it tells a much better story. The truth is, it could really have been either theory, or neither. The best quote to sum up this post come from Plutarch, "the truth of the matter no one knows". I guess it’s up to you to decide. Wow…This mystry will continue to fascinate and intrigue us! Thank you VERY much, Heather. I’ve decided to kick off the Historical Fiction Event, here on EBJ, with a giveaway of a book revolving around one of the great masters in history. Most of you know how I love Italian history and so, fittingly so, I’m giving away a hard copy of Leonardo’s Swans! 1 Chance: Leave a comment telling me who you think is ‘great’ in history. To continue with this exciting event, be sure to go to The Burton Review, where Marie interviews Allie from Hist-Fic-Chick. And there’s another wonderful GIVEAWAY there too! THE HISTORICAL FICTION BLOGGERS ROUND TABLE EVENT!! Throughout the week, a few of us like-minded bloggers will be hosting at eachother’s place; holding interviews, guest posts and giveaways- all for the sake of that wonderful world of Historical Fiction that we’re all crazy about. This will be a fantastic event in the Historical Fiction Blogosphere, and there will be a TON of stuff going on so I hope you can keep up!! Check us out on a daily basis to see what’s going on at our sites. AND...Get this: Along with this comes FANTABULOUS GIVEAWAYS! And that’s not all!!! Some of these HF guest bloggers will also be posting additional fun stuff and more on their site daily to keep you coming back for more. We would also love for anyone else to participate and take this event forward on their own blog. How you can participate: Paste our red HF Button on your own 'HF bloggers Round Table Event' post and make sure to link it back here. 4- Leave a comment on this post with a link to your HF post and we’ll be sure to mention the blogs who have participated in our HF SUMMARY of EVENTS- The following week. Announcing New Winner of Cleopatra's Daughter!! Here's the new winner for the author-autographed copy of Michelle Moran's Cleopatra's Daughter!!! Please email me with your contact info!!! Announcing Winner of Cleopatra's Daughter!! Congratulations:) Please email me with your contact info- you lucky girl! A Lady Raised High is the story of Frances Pierce, Anne Boleyn’s first maid-of-honour; loyal and faithful to her until the queen’s tragic end. Frances‘father was a baronet in Hertfordshire and her mother, a French baron’s daughter. The family pretty much ran their own estate and took care of their lands and tenants. Against the proper order of things, such as finding a husband and living off the land-Frances, a seventeen year-old girl who cared more about writing poetry than learning how to fold linen, aspired to a life filled with poetry, romance and adventure. Rather than the usual cheering and festive turnout for such an occasion, some of the local women had gathered mud to slay the hated woman who they thought bewitched the King into throwing their good Queen Catherine aside. Aware of their dangerous and humiliating plan, Frances immediately rides her horse to the receiving side to serve as shield and protector. Frances takes the blows of mud and stones for the beautiful Lady Anne. Anne is grateful to Frances for her display of courage and protection. In turn, she summons the brave girl to her court where she appoints her as lady-in-waiting. Needless to say, this is a great disappointment to Frances’ family. Despite her beliefs, Frances’ mother understands that being at court could increase her daughter’s chances of marrying well. Hence, she concedes and gives Frances permission to go. The story, seen through Frances’ eyes is told with such clarity and flow that it was an absolute pleasure for me to read this. Throughout the book we encounter historical figures that play both key and minor roles in Anne’s life. I really enjoyed reading some of the dialog that Frances shared with Mary Howard, her then good friend. Tid-bits of other characters’ lives are also enmeshed into the plot-making it such an interesting and credible read. For instance, George Boleyn is an integral part of this book seen through the eyes of an infatuated young Frances, bringing about a completely different perspective that resulted in a course of events that I wasn’t expecting at all. 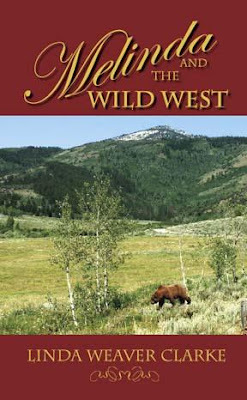 Another thing that was especially captivating was the way the author, Laurien Gardner, adds creative dimension without necessarily depriving her work of historical accuracy. Dialogs contain depth as well as spontaneity and the language is prim and typical of the times. A Lady Raised High brought Anne closer and more real seen through such a devoted perspective. That said, there was neither embellishment of character nor misleading interpretations. 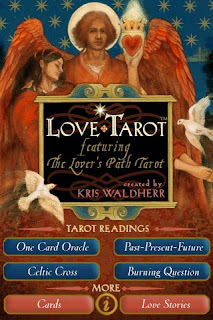 The storyline flows, reads well and is completely absorbing. It is an excellent read for Anne Boleyn lovers and for those who care to learn more about this misunderstood queen and the lady who served her as friend, confidante and devoted subject. So now this is for sure...I’m officially hooked on Georgette Heyer. The last time something like this happened I plunged head first into anything and everything Plaidy and never looked back- it’s not the same, I know; but there are certainly many similarities. There’s just something about historical fiction writers who keep the language of the times and make the dialog seem so real as though it were actually written back then. The details of the setting, the perceptions, the fashion, the attitude and behaviour of the people- there’s something to be said for this kind of historical accuracy. And when an author has got that under check, well then it’s all a matter of storyline and plot. That followed through beautifully for Heyer in this incredibly comical story that caught me laughing out loud quite a few times. I love it when a period read can keep me entertained this way- what a wonderful way to unwind with an amusing tale that manages to keep you hooked until the end. 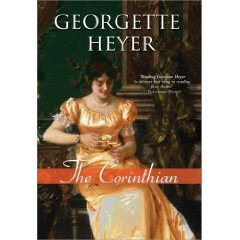 The Corinthian is a story about a worldly, fascinating and wealthy gentleman, Sir Richard Wyndham, and the young, very impressionable and mischievous Miss Penelope Creed. How these two very unlikely people get caught up into eachother’s lives is what this amusing book is all about. 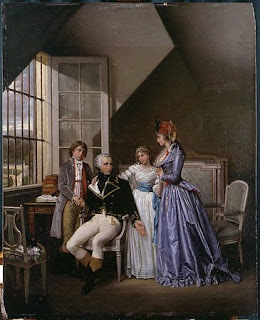 While Sir Richard’s family’s match-making gets him almost hitched into a marriage of convenience; Miss Creed’s own planned marriage throws her literally ‘over the edge’ to find both of these exasperated individuals who have lost hope in convincing others of their non-compliance meet on a not-so- coincidental evening. An incredibly original night out on the town, and a series of unexpected events, changes their fate forever. I absolutely loved this fast-paced read. There was not a moment of boredom or even time to ponder in this one. Like a domino effect, the pieces of the story just tumble into place regardless of all the sidetracking events that plead to yet again sway you into an ever developing and changing plot. Amazingly entertaining and as usual, a tender loving story -endearing throughout, but especially in its finale. Author Guest Post- Historical Ancestry Writing + GIVEAWAY!!! Today I have the pleasure of introducing to you, Linda Weaver Clarke- an author who actively brings historical writing to another level. It’s not often I come across and author that not only shares my passion for reading, writing, history- and teaching…But that’s not all- Linda also combines the love for family through historical ancestry research and writing, and, she teaches about it. How refreshingly close to home! “David and the Bear Lake Monster” was so much fun to research. My great grandmother, Sarah Eckersley Robinson, was my inspiration. I wanted to use her experiences for my heroine to bring some reality into my story. As a child, she lost her hearing but she never let her deafness stop her from living life to its fullness. I took a lot of her experiences from her biography and gave them to my heroine to bring some reality into my story. In my research about the “hearing impaired,” and talking to a friend who became deaf in her youth, I became educated about the struggles they have to bear. I didn’t realize that concentrating on reading lips for long periods of time could be such a strain, resulting in a splitting headache. After all my research, I found that I had even more respect for my great grandmother and her disability. 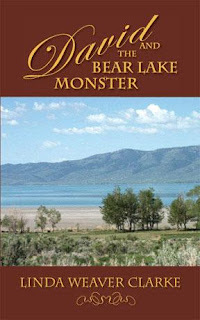 Now you may wonder about the Bear Lake Monster and how it fits into my story. Is it fiction or non-fiction? Well, my book is considered historical fiction so I decided to add some parts of history that may sound incredible to you but actually happened. One summer day in 1868, S. M. Johnson was riding his horse alongside the shoreline when he saw an object floating in the water. At first glance, it looked like a man’s body. He was shocked and thought that someone had drowned so he trotted his horse closer and watched the object but it didn’t move. When the water didn’t wash the body ashore, he figured it must have been a tree that was anchored to the bottom of the lake with its roots still in tact. As he watched this so-called tree, he said it opened a gigantic mouth that was large enough to swallow a man and it blew water from its mouth and nose. Johnson said that it had a skinny head, huge pointed ears, and three small legs that rose up from the water as it approached the shore. Is the Bear Lake Monster fact or fiction, legend or myth? Whatever conclusion is drawn, the legend still lives on and brings a great deal of mystery and excitement to the community. Does David believe in the monster? Of course not, and he’s bound to disprove it. Remember, when visiting southern Idaho, never doubt the Bear Lake Monster or you’ll be frowned upon. No one makes fun of the great legend of Bear Lake Valley! *****For today’s Giveaway, Linda has graciously agreed to giveaway one copy of her very first book: Melinda and the Wild West. What a wonderful way to become more familiar with this extremely interesting author’s work! 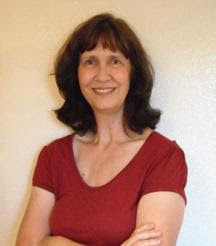 To learn more about Linda, her books, her writing and her workshops, be sure to visit her website, which contains excerpts from her books, interviews, an interesting biography section, short stories, UPCOMING EVENTS and tours. Now I’m curious to learn more about family historical writing and learning about my own ancestors…what a wonderful way to combine history and family while getting in touch with your ancestry and the love of writing. Talk about an interestingly creative edge. Thank You Linda for a fabulous insight in what you do and for spreading the interest for history and family through your work and writing. You certainly are an inspiration for all aspiring Historical Fiction writers! Today marks the birth date of Eugène Rose de Beauharnais, Josephine’s first and only son by Alexandre de Beauharnais (her first husband). Eugene had a wonderful and close relationship with Josephine, who in turn was especially attached to her firstborn. Eugene was never the brilliant scholar or the very literate type as his father, Alexandre would have liked him to be. In other words, the two did not have much in common- Eugene was somewhat of a slight disappointment for his father. The young boy, who preferred riding his horses to reading books, had a spirit that soared for adventure. But, he was also blessed with a gentle and caring nature, which would explain why Josephine adored him so; He never disappointed or hurt his mother, whom he loved more than anyone in the world. He was also very protective and loving towards his sister Hortense. He became her pillar of strength and confidant, especially during the years of her dreadful marriage. Eugene was thirteen when he lost his father by ways of the guillotine. Not long after this crucial time, Josephine was also incarcerated, leaving Eugene and Hortense often cared for by the people in Josephine’s immediate circle- and other times, just fending for themselves in the streets. This certainly added a dimension of sorts to his teenage years, spurring him rapidly into manhood and into the role of protector of his younger sister. It is of no surprise that when Josephine and Bonaparte became an item, that Eugene immediately felt drawn to Napoleon’s magnetic persona. The emperor engulfed all the qualities of leadership, adventure that Eugene also had a passion for. And, the fact that this great man also loved his mother dearly, showing much more fervor in her regards, than his own standoffish father ever did, endeared him even more so. The affection was mutual, and Napoleon taking a special interest in this willing and promising young man, showed him his love and appreciation by adopting him in 1806; he was 25. 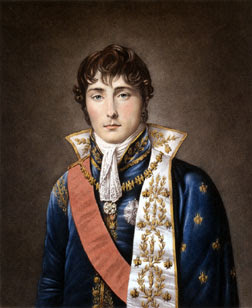 Eugene always fulfilled his duties as a loving son, devout combatant, dedicated leader and most loyal disciple of Napoleon Bonaparte the Emperor. He even accompanied his father to Egypt, where he experienced and witnessed excessive forms of battle…in fact, when he returned from these battles, he was particularly silent and distant, alarming Josephine and causing her great pain to see this sudden and extreme change in her son. Yet, it still remained that what was important to Eugene was that he had not failed Bonaparte-he had made his father proud. His dedication went beyond the call of duty and his loyalty made it such that within the course of actions, he never deterred to remain faithful until the end. Eugene was also a loving husband to his wife Princess Augusta Amalia Ludovika Georgia of Bavaria, whom he married in 1807. She was the eldest daughter of Maximilian I of Bavaria. Eugene was a devoted husband and most loving father to their seven children. Josephine reveled in their loving relationship. She was extremely proud of her son and the wonderful, man, husband, father that he had become despite the exceptional and tumultuous challenges he was dealt with in his youth. In terms of royal titles, in 1804, Eugene was bestowed the title of French Prince of the Imperial Royal Family. Then in 1806, his royal father-in-law made him Duke of Leuchtenberg. And in 1807, when Bonaparte united Venice to his Kingdom of Italy, Eugene was made Prince of Venice. Consequently, all of Eugene’s children were royals who themselves married into royalty; thus, rendering them heirs in direct lineage to Josephine, their grandmother.